Unified messaging describes a software or service that combines different ways of communication in one application. VoxOx comes out of private beta with an impressive looking number of services. The software combines Instant Messaging, Voice over IP, Video Conferencing, Email, Text Messaging, Social Networks and File Sharing into one software application. That many features have its price though which observant users will notice after taking a look at the computer memory that the VoxOx processes uses. A little bit less than 100 Megabytes on Windows leaves surely some room for improvement. The client is available for Windows and Macintosh with a Linux and mobile client in the making. The first step after installation is the account creation which is done easily in the interface. The program reminds the user that an email will be send for verification purposes. That message however seems to have been a leftover from the past because it was possible to login right after signing up to the service. An email was send but it did not contain a verification code but only information about the service itself. A wizard will pop up after logging in that can guide the new user through adding accounts to the unified messaging software. It is possible to add AOL, ICQ, Yahoo, Google Talk, MSN or Jabber Instant Messaging accounts or other accounts such as Yahoo Email. Some of the options are grayed out which seems to suggest that these networks have not yet been implemented fully in the software. 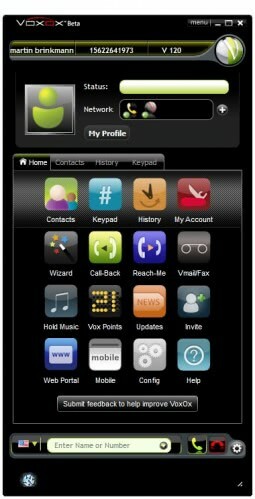 The interface looks shiny and modern but poses a problem for users who like to change the sizes of their applications. The size of the application's window cannot be reduced indefinitely which means that it will look huge on smaller monitors. It can be minimized though which reduces the memory usage tremendously as well. The website and client are missing some vital information though, especially about pricing. There is no information whatsoever on costs for calls, text messaging or video conferencing. Business users should probably wait until those information are published on the developer's website and in the client before they start evaluating the unified messaging software. Is this application confirmed to be legit/safe? I don’t want to log in with my ICQ password(s) until I have the assurance, that everything is legal. VoicePlus provides unified messaging, voice response, integrated call processing systems and custom applications that deliver superior messaging services and communication solutions to various types and sizes of business.